Ever since the material design for mobile apps was introduced by Google it has become a trend with the top rated apps for better UI & UX. The landscape of UI design is ever evolving to provide a refreshing look and feel to the digital solutions, be it website design or mobile app design. You never know when today’s design trends will become tomorrow’s faux. 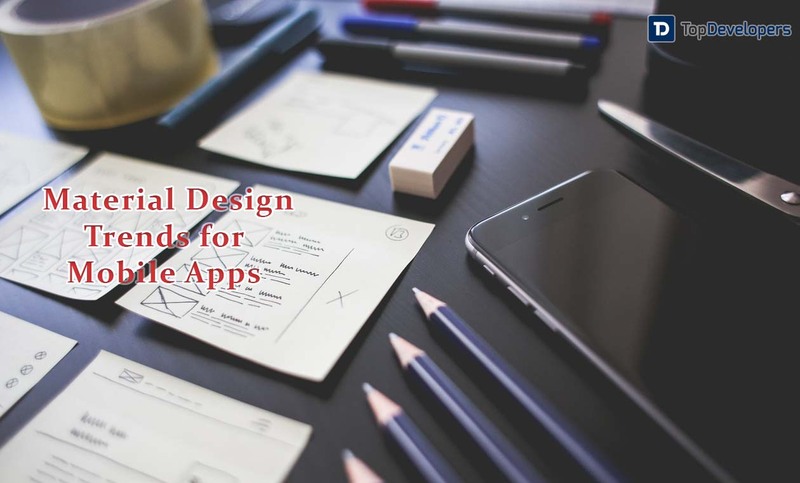 Keeping up with the design trends is all-important for the mobile apps to gain and sustain the prominence in the market. For instance, it’s just a matter of a decade old, when skeuomorphism considered as the excellent design trend as it emulates the materials and creates a sense of familiarity. But, after some time, the complete opposing design style- flat design came into the picture, which was based on the utilitarian element where the designs were flat and made efficient use of space available. Later, in 2014, another design trend- MATERIAL DESIGN trend come into forth wherein the aesthetic of skeuomorphism was added to the flat design. It was released by Google to completely provide a makeover to the Android applications with improved UI, systematic and content-focused design features, clear iconography, vibrant colors, minimalism, grid-based layout, lighting, shadows, padding and clean schemes. The material design’s guiding principles are classic and tweaking them a bit with technology innovations would enable the UI designers to craft phenomenal designs. The digital commerce has also welcomed the material design trend with open arms to enhance visual appeal, generate micro-interactions, engineer the best user experience and establish the brand identity. It’s no wonder that design language has become so popular. Card layouts- Make the Content shine! The card layout is an integral part of the material design that still rules the design kingdom. The UI and UX designers get a lot of opportunities to experiment and come up with a myriad of layouts which differ in forms and type. A large amount of information can be better organized as split chunks in the boxes and make the content more dynamic, interactive, and easily accessible. The card layout is the excellent metaphors that have added usability to the visual aspect so that users can quickly navigate and access the content they need effortlessly. These layouts are very popular on the social media websites such as Facebook in news feeds or boards. Facebook has adopted card-driven interface and container-style design to group the content into meaningful sections to make the content easily digestible, visually appealing and offers a consistent experience across the devices. It’s pretty vivid that the app will automatically become outstanding if the users are able to find a way around it in no time. Hassle-free navigation is a key to start the conversation. That’s why, in 2016, Google introduced the bottom navigation (Tab bar) feature to craft a flow in the mobile app that allows the users to easily navigate and discover the features. It’s advised to keep three to five important destinations in the bottom navigation to remove complexity, present action with icons, and optimum use of colors and text labels in the bottom navigation to make the navigation self-evident, clear, simple and easy to access. See how Instagram made the core features available in a single touch with bottom navigation. Insert the bottom navigation for Android Instagram When the bottom navigation helps users to meet their goals, then for sure, the actions you want the users to take, they will be initiated, which in turn meet your goals. Animation adds a human touch, infuse life into the UI and make the experience feel crafted to provide a response to the user’s action, guide users how to interact with the UI, show system status or highlight changes. The visual feedback plays a significant role to make users respond to the interactions, wherein buttons and controls come into the scene. Animated buttons and controls with visual and motion hints create responsive interactions, which helps users to figure out what’s going on and foster the users to react with the input and explore the app. Also, functional animation can be used to better inform the users about the app’s process status and work as a real-time notification to make the users understand the system status and keep them engaged. With all pluses, the motion design trend undoubtedly becomes popular. Transitions are mainly used to provide the details to the users that are beyond the scope of actions and icons. The motion design enables the icons or actions to perform dual functions visually. The changes in the arrangement of the element are explained visually on a mobile app screen that direct the user’s attention where it has to be and encourage the users to interact. The element must cohesively travel in a direction and colors should be used optimally between the two states to make the transition clear and smooth. The coordinated and orderly motion can be used in all components of the app. Unquestionably, Material Design is an evergreen trend that will maintain its eccentricity in the mobile app design trends. Card-based layout, responsive animation, transition and bottom navigation are a few names among those trending. There might be other design trends that are not on the list, but we can expect them to see the trends in the time to come. Material design trends make your app UI design speaks. Optimize your mobile app UX with the material design development to best accommodate the user’s needs and get to the top of their mind. Embrace the latest UI trends now!